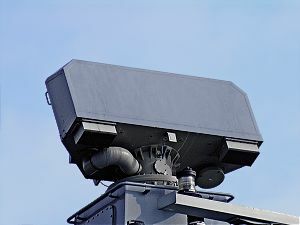 The Sea Giraffe AMB is a C-Band naval 3D, multi-function search radar. The radar provides air surveillance and tracking, surface surveillance and tracking, target indication for ship weapon system, and high resolution mapping capabilities. The Sea Giraffe AMB is optimized for, and is in service on, vessels such as the Swedish Visby Class corvette and the US Littoral Combat Ship Independence class. The version of the Sea Giraffe AMB installed on the LCS Independence Class has been designated the AN/SPS-77 (V)1. AMB stands for agile multi-beam, and incorporates a stacked beam solution. The Sea Giraffe AMB has 12 simultaneous receiver beams in elevation and is using monopulse technique to calculate the accurate elevation.